Terriers remained at #11 in the USCHO weekly poll, but moved up a notch to #9 in the USAToday/USA Hockey Magazine poll. Sean Maguire, Matt Nieto, Danny O’Regan (photo) and Evan Rodrigues all made the Hockey East top performers’ list for the week.Over the past three weeks, no other player in the country has more points than O'Regan . He has a 4-7-11 scoring line in six games, as the freshman has 11 points (4g,7a) in six games. Sahir Gill’s game-winning goal Friday night against Providence came in his 100th career game at BU. Blog contributor mh82 reports that College Hockey Inc. has introduced a new statistics platform that provides detailed statistics, including faceoff wins and losses, blocked shots and others, for every Division 1 team. There are the options of using various filters and choosing a number of statistics categories, so look around and explore. Here’s the link for BU stats. It’s also now in our list of links in the sidebar. 2013 recruit Brendan Collier registered three assists in the Valley Junior Warriors two weekend shutout wins over the Philadelphia Revolution, 2-0 and 4-0. The former Malden Catholic captain has an 8-22-30 scoring line in 35 games. Looking to upgrade his game after the Blues were eliminated by the Kings last season’s Stanley Cup Playoffs, Kevin Shattenkirk sought the counsel of longtime NHL standout blueliner Al McInnis. Details from the St. Louis Post-Dispatch. The Boston Herald’s look at how many NHL players spent the lockout features Nick Bonino’s sojourn to Italy where he became the leading scorer for HC Neumarkt-Edna Riwega. Former Terriers Adam Clendening (West) and Eric Gryba (East) will compete in tonight's AHL All-Star Classic in Providence. Scarlet gave way to pink as the Terriers marked Skating Strides Against Breast Cancer day by edging New Hampshire, 3-2, at Walter Brown Arena. Isabel Menard’s fourth game-winner of the season came midway through the middle period as the senior finished off a pretty give-and-go with Louis Warren. 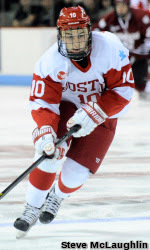 Junior co-captain Marie-Philip Poulin was the subject of a recent Women’s Hockey East All-Access interview.